Prime Minister's interrogation took place in his private residence, but wife and son interrogated at Lahav 433 offices in Lod. 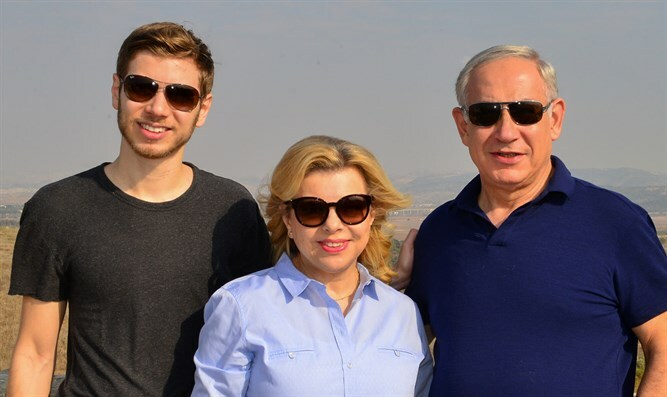 The Israel Securities Authority and the police announced that Prime Minister Binyamin Netanyahu, his wife Sara, and son Yair were interrogated for several hours today at the Prime Minister's home, the Lahav 433 anti-corruption unit and the Israel Securities Authority. It was further reported that the investigation is being conducted under the supervision and guidance of the State Attorney and with the approval of the Attorney General. The Prime Minister's interrogation took place at his private residence, while his wife and son were interrogated at Lahav 433 offices in Lod. Interior Minister Aryeh Deri was also questioned in the Lahav 433 unit's offices. This is the eighth investigation of the Interior Minister since the criminal investigation against him was publicized. "I finished my last interrogation and as usual I answered all the questions," Deri tweeted in his Twitter account. "Everything is good and it get even better." "Now I turn to important business: Helping my wife Yaffa with the Passover work, preparing for the Kabbalat Rabo conference on Monday, and especially helping as many needy people as possible to celebrate the holiday with joy and comfort." Lahav 433 is known as "Israel's FBI" and is currently charged with investigating Netanyahu in the cases known colloquially as 'Case 1000', 'Case 2000', and 'Case 4000'. While Lahav 433 is considered the Israel Police's most elite investigative unit, it has suffered a long string of embarrassing incidents. In February last year, former unit commander Menashe Arbiv was convicted for failing to report to his superiors that he had been offered a bribe by Rabbi Pinto, a charismatic and popular rabbi who eventually served a one-year jail sentence in 2017 for his effort to bribe police Brigadier General Ephraim Bracha. Arbiv was suspected of receiving illicit benefits for years from Pinto in exchange for information about a police investigation into Pinto's charity.